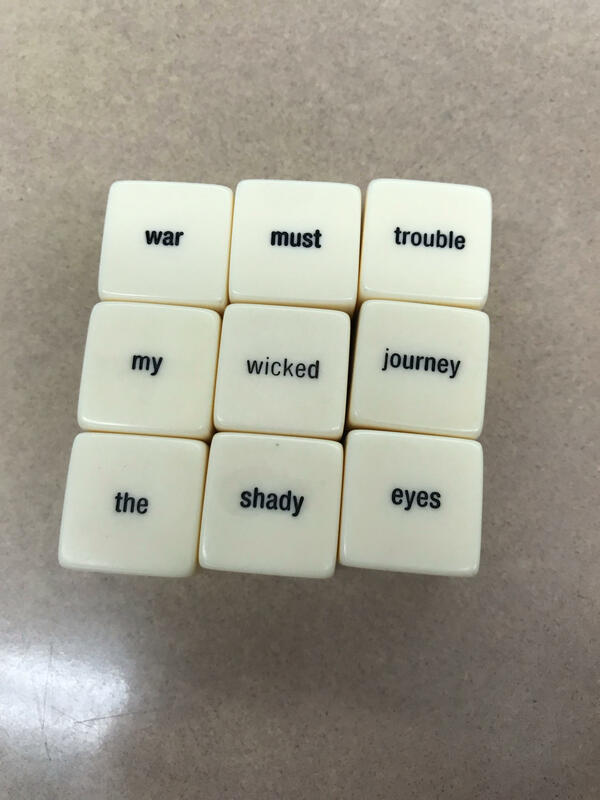 I bought Haikubes this summer as I was searching for ways to add makerspace ideas to my high school English classroom. I finally opened the package yesterday. We only had 2 days of school this week before Thanksgiving vacation so I thought it was a perfect opportunity to try out these nifty, little cubes. I was a bit disappointed at first when I started to read the cubes. There are virtually no nature words on these cubes. And as you know, Haiku are traditionally about nature. There are blank spaces on the cubes as well, so maybe I could just take a Sharpie and write-in some nature words. I reviewed with teh students the basics of Haiku–no rhyme, no similes, usually about nature, and usually 3 lines. We also discussed how they previously learned that there are 17 syllables in Haiku. 5, 7, 5, but I informed them that to more closely match Japanese sounds, 13 syllables is more precise. I divided the students into groups, and handed out a handful of cubes. I started to hear some giggles, and see some smiles. They took photos of their creations and we viewed them on Apple TV. I will probably use these Haikubes again. Previous A Christmas Carol–Maker Station Style! Next HUGE SALE!!! 20% off EVERYTHING in my Teachers Pay Teachers Store!